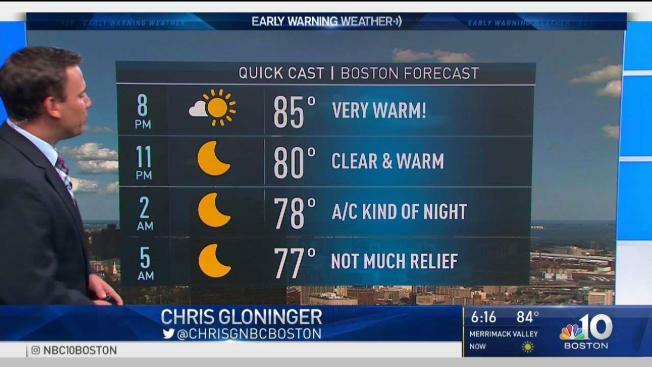 The heat is on and it will continue through Independence Day on July 4. Temperatures will rise quickly under sunny skies Saturday, from the 70s into the 90s. With humidity values also increasing, the heat index is expected to be in the triple digits across inland locations for the next several days. The exception is along south facing shore with wind from the south or southeast at 5 to 10 mph, keeping us cooler. It is very important to stay hydrated and avoid being under the sun for prolonged periods of time. An excessive heat watch has been issued from Worcester westward and also for Connecticut. Heat advisories have been posted for southern New Hampshire and southern Vermont. Spotty showers and isolated storms will impact Northern New England on Saturday, the greatest threat is from Burlington, Vermont to Bangor, Maine with a clusters of strong storms possible by this evening. There’s a risk for lightning, downpours, damaging wind gusts and even a quick spin-up can’t be ruled out. This wave of energy will impact the local weather for Boston and beaches for Sunday, keeping coastal towns in the upper 70s to mid-80s. On Monday, the contrast of temperatures remains, as inland locations will be in the upper 90s while highs near coastal towns will be in the 80s. Highs will rise again just in time for the holiday, with most of New England experiencing hot and humid weather, and just a slight chance of thunderstorms Wednesday evening right before the fireworks. 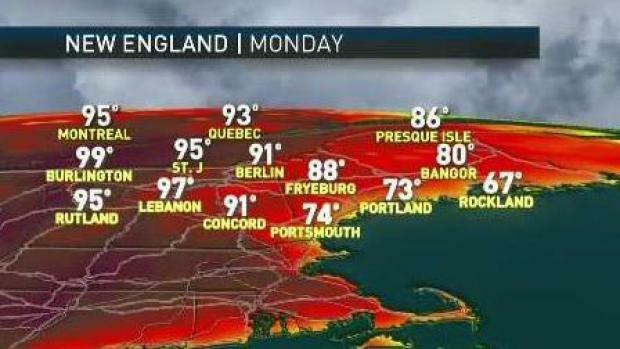 For inland New England, this weather could evolve into a 5- to 7-day heat wave.